I have heard may ambulatory adults with CP say how much they enjoy and have benefitted from karate. 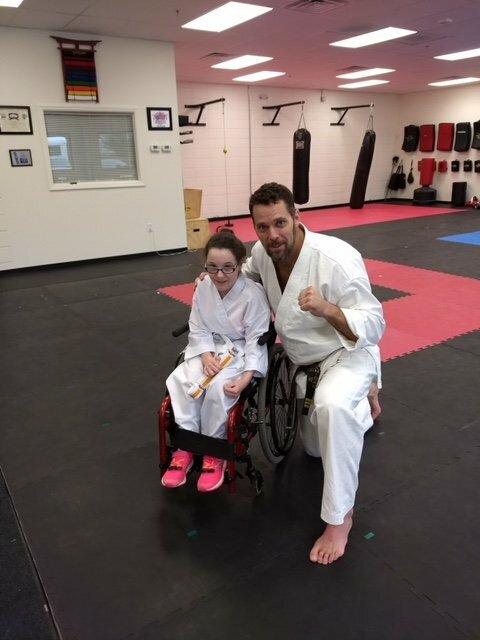 But, I never thought karate could be modified enough for Maya (a wheelchair user with spastic quadriplegia) to both enjoy it and physically challenge herself. She has proven me wrong once again. This year when she told me she wanted to participate in a karate class once a week, I worried Maya would be sitting off to the side and not moving much at all, while the other children practiced karate moves and played together. I didn’t push back because karate was built into her class time and I knew I could count on her to tell me or her teaching assistant if she felt awkward or left out. During the third week of school, exhausted and moody during her after school physical therapy, Maya told me and her therapist that she was tired from her karate class that day. I thought she must be playing possum. As I watched her struggle to move, I considered the validity of what she said about being tired from karate, but quickly dismissed it. I truly didn’t think it was possible for her to exert herself so much with her upper body that she would be so wiped out. Over the next few weeks however, I realized karate provided Maya with personally meaningful challenges and more participation opportunities than I thought it would. The more I heard about how she was challenging herself, the more I realized we had to make an adjustment to her schedule. At first, I proposed she do less activity during karate so she would still have energy for therapy. Unfortunately, that didn’t work out because even with half of a karate lesson, she was still having trouble with her stamina and now, she was also upset that she was missing out on some of the karate class. Trying to come up with an easy solution, I half-heartedly proposed that she change therapists and therapy days if she wanted to continue. I never thought she would agree to this because she loves her therapist, she takes PT very seriously and she doesn’t like change. Imagine my surprise when she turned to her therapist, who she adores, and said, “I am so sorry C. and it’s not about you, but I need to change therapy days.” Clearly, she was serious about karate. It took me a few days to wrap my head around prioritizing a “bonus activity” over physical therapy, but then I realized that the karate experience was as vital to her development as her therapy. 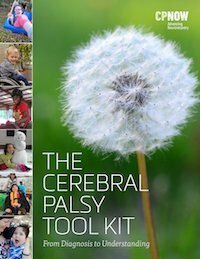 Many children begin to choose activities over therapy as they get older. Pre-teens and teens want to be with their peers and do what they are doing—enjoying life and having fun instead of sitting in a therapy center with their parents and therapists. At this age, if we can find a way to balance the need for some structured therapy time with fun yet challenging activities like piano (now modified guitar too!) and karate, Maya is more likely to remain more active, healthy and happier throughout her life. Once I got passed the initial stress of adjusting her therapy schedule and switching therapists (no small thing), I have been over the moon with the results. Maya has found a new activity she loves, her upper body is becoming stronger and her range of motion has improved tremendously. She also is enjoying the structure and discipline of the class. From dance, to piano–where she initially required three people to support her body–and now to karate, Maya has shown me repeatedly that she has the determination, patience and hidden skills to do much more than anyone imagines (and the people around her set the bar high). She even continues to surprise her biggest champion, her Mom. This is a great, and important, story, reminding all of us to stay open to new possibilities. Maya is inspiring me to challenge myself more in the physical activity department. Thanks to Maya and her mom! This is so beautiful! Go Maya!